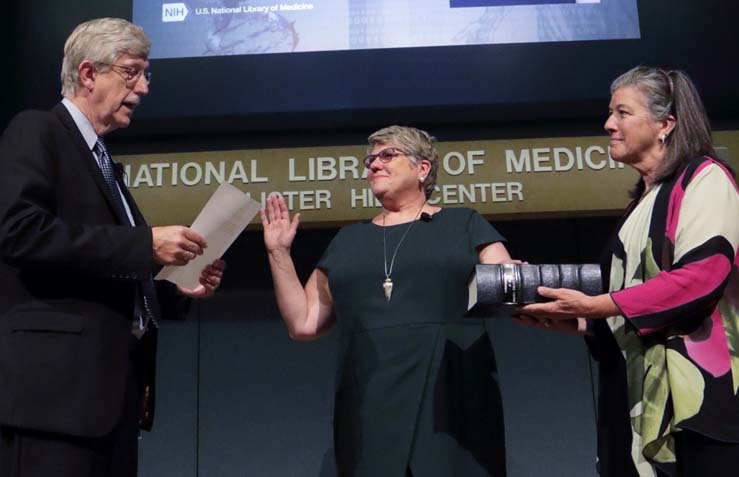 On September 12, Patricia Flatley Brennan, RN, PhD, raised her right hand and publicly swore in as director of the 180-year-old U.S. National Library of Medicine. She is the first woman and first nurse appointed as director. 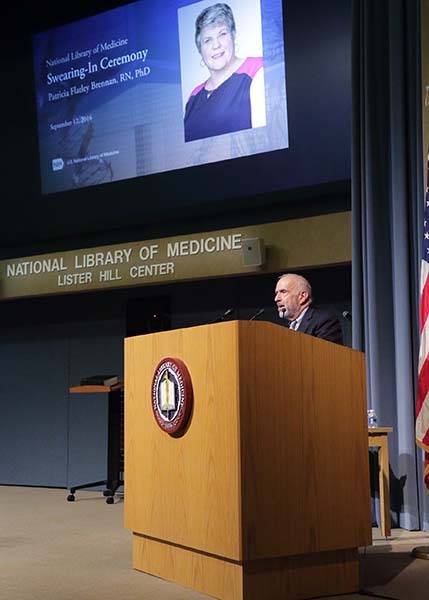 In a ceremony at NLM’s Lister Hill building, Dr. Brennan became the 19th director of the Library and the fourth person to serve as director since the institution became the US National Library of Medicine 60 years ago. 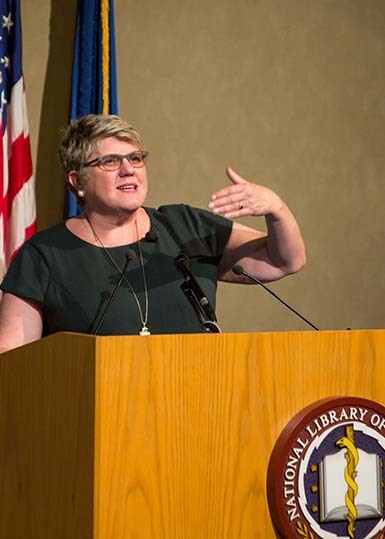 In her introductory remarks, NLM Deputy Director and former Acting Director Betsy Humphreys provided a historical perspective of the Library and described Dr. Brennan as exactly the right choice at the right time. After Humphreys introduced Dr. Brennan and the thunderous applause subsided, Dr. Brennan said she felt delighted, honored, and gratified. She began her remarks by introducing herself—personally and professionally. She is the mother of her son Conor, the daughter of Lois and Tom Flatley, and the second of ten siblings, many of whom were in the audience. Dr. Brennan has blended nursing and industrial engineering in a vibrant research career applying informatics to empower patients and caregivers. Using slides and videos, her presentation drew on the Library’s history and celebrated its present to focus on its future. 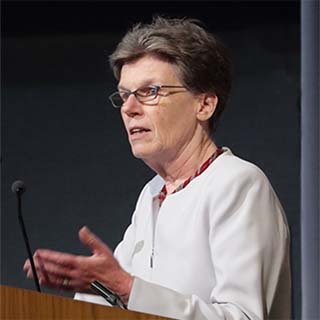 “As we anticipate our third century, it is important to look around, outside of this library, to forecast the health challenges that we must help solve,” she said, citing genetic discoveries, precision medicine, infectious diseases, and chronic diseases. Dr. Brennan talked about taking a life-span approach to understanding disease, creating learning systems that better leverage data to manage health, and enabling improved treatment and better self-management by harnessing technology. After Dr. Brennan’s presentation, Dr. Collins spoke for a few minutes before delivering the oath of office. 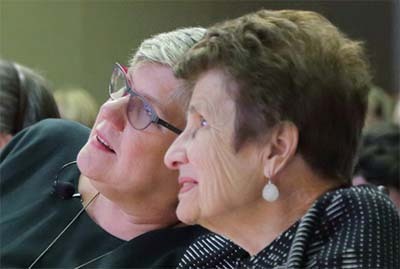 He shared, based on the broad diversity of programs and disciplines in the NLM portfolio, how challenging it was to find all the attributes needed to lead NLM in a single leader. 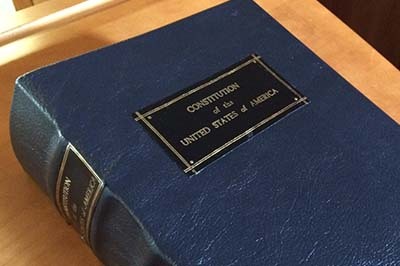 Adding to the gravitas of the swearing-in ceremony, a commemorative bound copy of the US Constitution, including analysis and interpretation (and coming in at over 2,300 pages), was used for the oath of office. The book was originally presented to Congressman Claude Pepper, author of the legislation creating the NLM National Center for Biotechnology Information, at the 200th anniversary of the signing of the Constitution in Philadelphia in 1987. With her older sister, Jean Flatley McGuire, PhD, holding the historic book and attendees recording the moment with cell phones held high, Dr. Brennan took the oath and officially assumed the office. As her family, friends, coworkers, and guests gave her a standing ovation, Dr. Brennan hugged her mother and waved to the crowd. 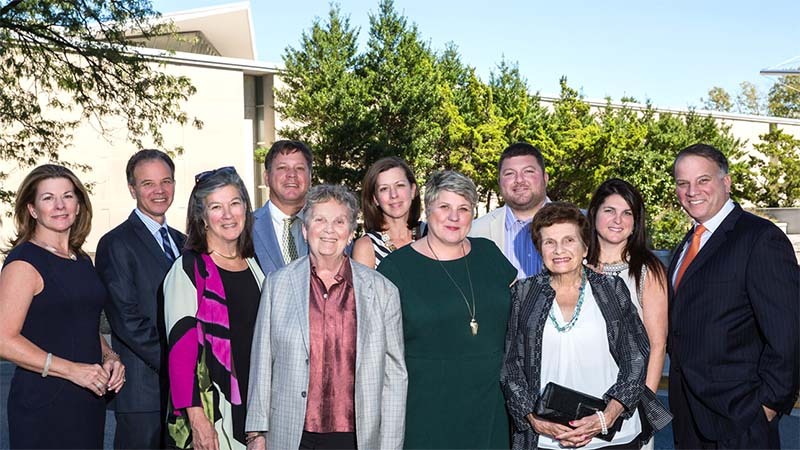 After the ceremony, guests from Wisconsin to Washington, DC, gathered for a reception hosted by the Friends of the National Library of Medicine that felt a bit like a family reunion. Attendees mentioned feelings of energy, promise, and excitement in the air as the Library prepares for a third century. September 19, 2016 in Events.